The online version of this article ( https://doi.org/10.1186/s13287-019-1218-9) contains supplementary material, which is available to authorized users. Traumatic spinal cord injury (SCI) leaves an affected individual with reduced motor, sensory, and autonomic functions as well as reduced quality of life. Mesenchymal stem cells (MSCs) are fibroblast-like cells that adhere to plastic, grow in colonies, self-renew, and differentiate along the mesodermal lineage. MSCs transplanted following SCI in rodents reduce glial scar formation, cystic cavity size, and lesion size and enhance angiogenesis, tissue sparing, axonal regeneration, and re-myelination. They also alternatively activate macrophages and reduce inflammation. These beneficial modulations have been correlated with improved recovery in hind limb motor function [1, 2, 3, 4, 5, 6, 7, 8]. It has been suggested that transplanted MSCs differentiate along the ectodermal lineage [4, 6, 9], but others have suggested different mechanisms [2, 10, 11]. Transplanted MSCs have demonstrated the capacity to enhance the expression of neurotrophic and growth factors in the recipient [2, 4, 7]. Both the differentiation and the elevation of neurotrophic and growth factors have been proposed as possible explanations for the enhanced recovery of hind limb motor function [2, 7, 9, 12, 13]. In culture conditions, MSCs release extracellular vesicles (MSC-EVs) containing proteins, trophic factors, cytokines [14, 15], mRNA [14, 16], and microRNA [14, 17, 18] through which they modify neighboring cells and mediate neuroprotective and immunomodulatory effects [19, 20, 21]. The regenerative potential of MSC-EVs seems to depend on the culture conditions [22, 23]. For the time being, the release of MSC-EVs is thought to be the main mechanism of action of MSCs. Transplanted MSCs were detected in both injured and uninjured spinal cord at 7, but not 14, days following transplantation. The short-term survival is in line with the findings of Jung et al. and others [13, 28, 29, 30, 31]. However, it was not within the scope of this study to determine whether the fluorescence faded or if the MSCs perished. 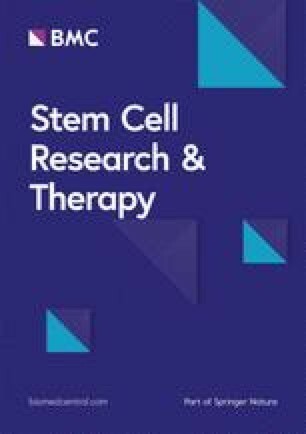 Considering that a commonly available expression construct was implemented, the fluorescence did not fade in culture conditions, and other authors have reported short-term survival, we confidently hypothesize that the MSCs perish between 7 and 14 days following transplantation. Hence, the lower limit of survival seems to be 7 days, but the upper limit remains uncertain. 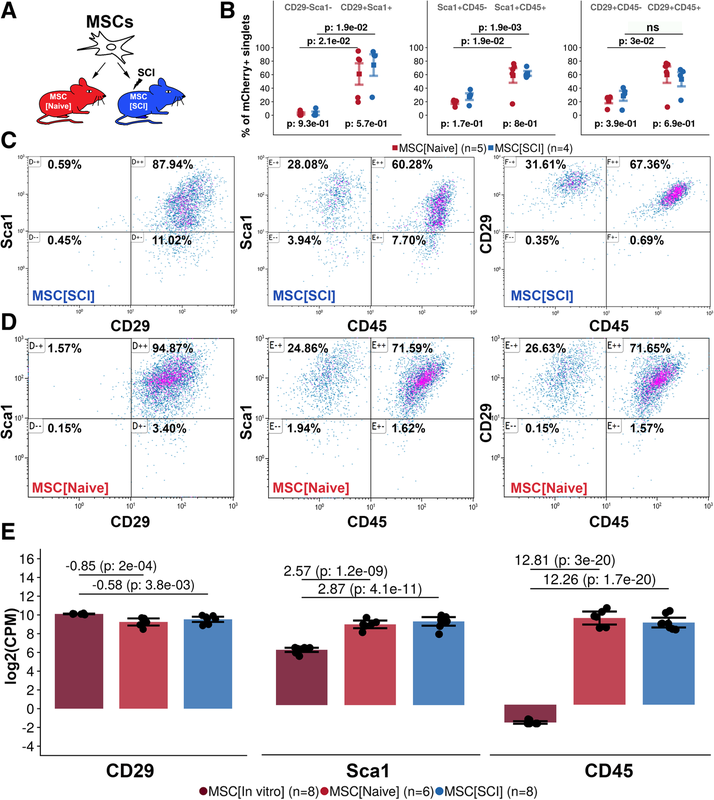 Even though the Caspase-3 expression in transplanted MSCs was negligible, the global transcriptional analysis revealed that transplanted MSCs significantly upregulated genes and GO/KEGG terms related to ubiquitination and apoptosis. In the few cells which were observed and reported as Caspase-3 positive, the staining was sometimes difficult to distinguish from phagosomes. 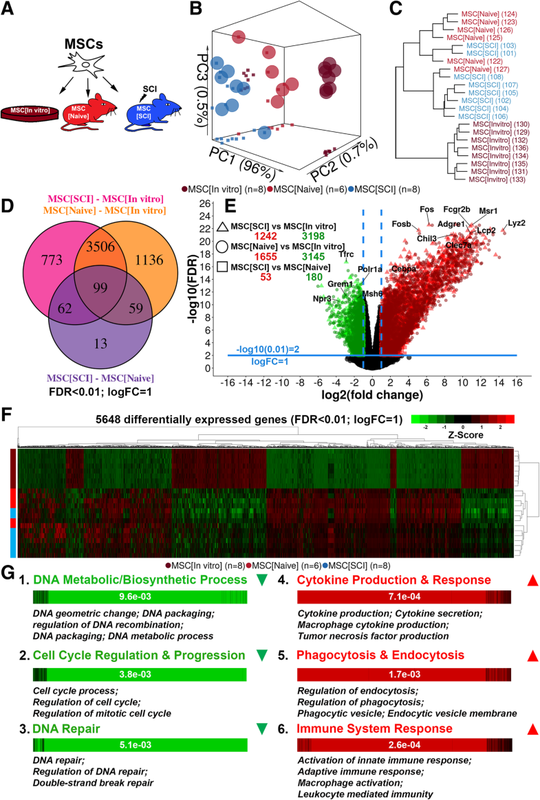 However, considering that the global transcriptional analysis revealed an upregulation of genes related to phagocytosis, it is likely that the MSCs did indeed have phagosomes, which confirms their adoption of immune cell-like characteristics. Hence, the lack of detectable MSCs at 14 days post transplantation is likely cell death resulting from the challenging environment. Additionally, the downregulation of genes related to DNA repair in transplanted MSCs, in combination with the downregulation of genes related to cell-cycle activity, supports the theory that MSCs are struggling to survive within the recipient and simply perish between 7 and 14 days post transplantation. Given that the MSCs manage to secrete enough tissue and immunomodulatory factors [14, 15, 21, 32, 33, 34, 35, 36, 37, 38, 39, 40] during this time to enhance recovery, the short-term survival is not of great concern. However, it is interesting to speculate whether long-term survival could enhance recovery further. Transplanted MSCs did proliferate in both injured and uninjured spinal cord, but at about one ninth of the rate in culture. This is in line with the findings in the global transcriptional analysis which indicated that genes related to cell-cycle progression/regulation were downregulated and detected using EdU in a small number of cells. This in combination with the downregulation of genes related to DNA processes and repair indicates that the MSCs are active within the recipient but slowing down. The lower rate of proliferation in vivo as compared to in culture is most likely also a consequence of the hazardous SCI environment limiting the nutrition and oxygen supply and resulting in a less beneficial growth environment. Transplanted MSCs did not differentiate in the injured or uninjured spinal cord. Since MSCs are from mesodermal and not ectodermal origin, this result was expected. However, Aras et al. and others found that transplanted MSCs could differentiate into astrocytes [12, 41, 42], oligodendrocytes [4, 43], and neurons [4, 6, 9]. Interestingly however, the global transcriptional analysis revealed that MSCs in SCI upregulated gene expression of TuJ1 and GFAP, which is more in line with previous reports. The lack of differentiation detected in this study might be due to the time point of evaluation, the tissue from which the MSCs were established, the severity of the injury, the type of injury, or a similar factor. However, most authors in the field are convinced that MSCs mediate their beneficial modulation of the microenvironment mainly by paracrine effects [2, 10, 13, 28]. Assuming that this is true, the lack of ectodermal differentiation is of minor importance. Taken together, MSCs survive for a brief period of time during which the MSCs do not undergo apoptosis but a fraction is active and proliferate. 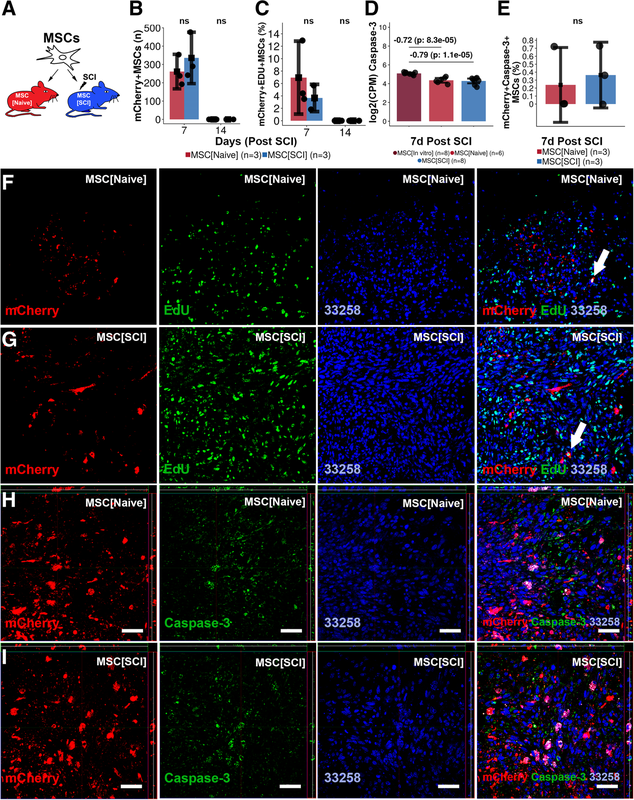 Moreover, MSCs do not undergo neural differentiation following transplantation, which supports the theory that MSCs act through tissue and immune system modulation early on following transplantation rather than trans-differentiation and integration. 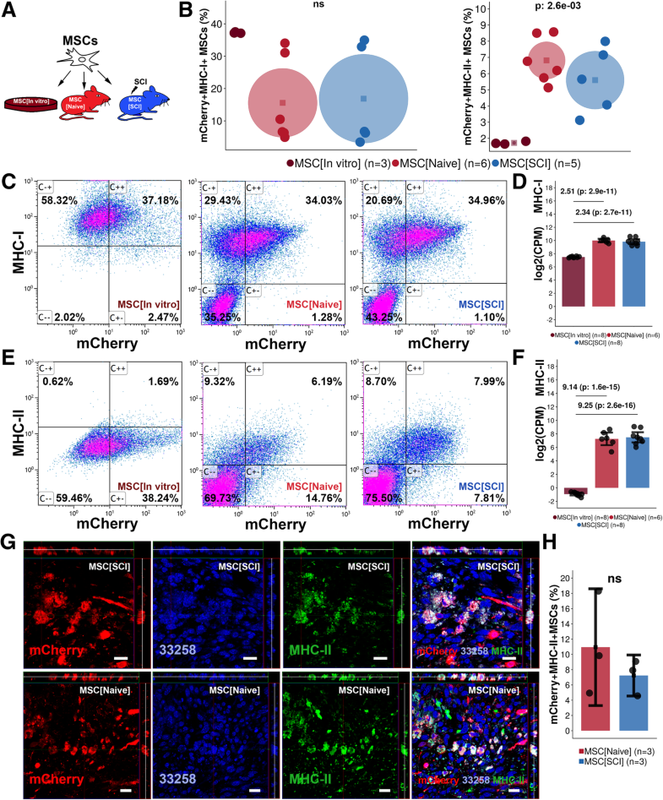 Extracellular vesicles are secreted from endosomal compartments of MSCs (MSC-EVs) [50, 51] and have been characterized as mediators of the immune-modulatory effects of MSCs [15, 32, 33, 34, 35, 36, 37, 38, 39, 40]. Assuming that MSCs mediate the majority of their therapeutic effect through paracrine effects, the content of the MSC-EVs is highly interesting to investigate. But, it is reasonable to hypothesize that at least some of the transcriptional changes induced in MSCs by the in vivo environment are transmitted to the surrounding tissue using MSC-EVs. 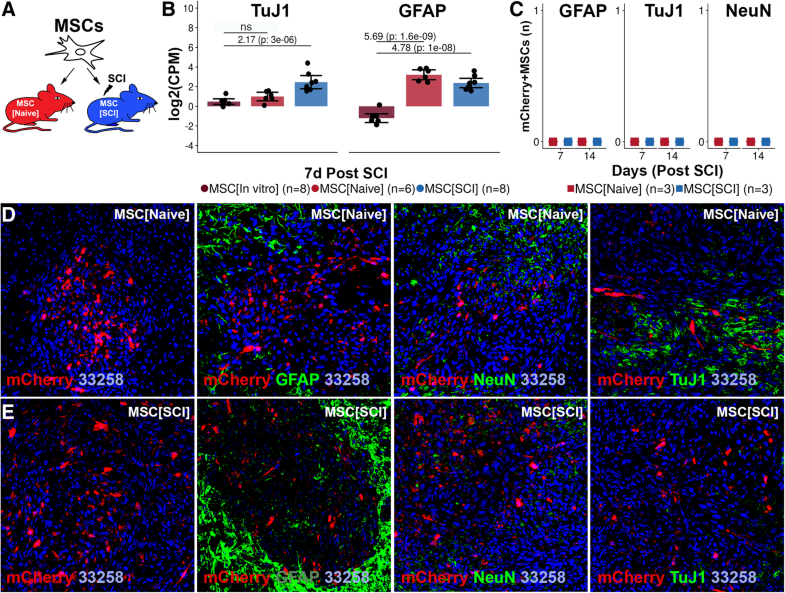 Identifying, isolating, and sequencing MSC-EVs released by transplanted MSCs would potentially reveal the full mechanism of action of MSCs. Given that the cargo—or at least essential parts of the cargo—could be constructed synthetically and administrated directly to a patient, the need for MSC transplantation could perhaps be abolished. This study however aimed at investigating the cellular response of transplanted MSCs and did not aim to identify any potential therapeutic agents secreted by the MSCs.